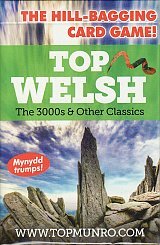 Top Welsh contains 100x62mm plastic coated trumps cards featuring 33 Welsh mountains selected mostly by height but with an eye on geographical distribution and popularity. The pack allows for 2 or 3 players to play easily. The cards arrive wrapped in cellophane in a laminated tuck box for added protection. Full instructions are included. Each card features a photograph of a Welsh mountain and six key facts/criteria about that hill and a potential route to climb it. The card reverses feature range maps so you can check the location of the summit within its range should you wish to.